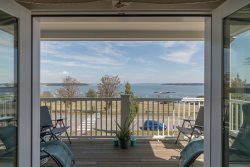 Unfurnished 3 Bedroom 2 Bath Home with Commanding Views of Casco Bay and Beyond. Enjoy the open concept main living area with living room, dining area and full kitchen with gas range. Home includes hardwood floors throughout, a beautiful jotel wood stove, second floor master suite and expansive bonus room above the garage. First floor also includes two additional bedrooms a full bath and laundry room.